The mission of the Stone House Center for Public Humanities (CPH) is to provide for the western Pennsylvania community to celebrate cultural heritage, foster innovative educational experiences, and highlight the humanities' relevance to contemporary life. Scroll down to learn about some of our exciting programs. A digital collaboration between SRU's Center for Public Humanities and the Butler County Historical Society, Butler County Historical lets you explore the people, places, and moments that have shaped the county’s history. Learn about the region through layered, map-based, multimedia presentations, use social media to share your stories, and experience curated historical tours of western Pennsylvania. Mobile app for Android and iOS coming soon! Each Homebrewed event focuses on a different historical culture. Previous themes have included Ancient Greece, Colonial America, and the British Empire. Events are held twice a year. Check out our News & Events for upcoming offerings. This unique program introduces college-level humanities to low-income and under-represented high school students through weekly sessions with Slippery Rock University professors. This program is supported by Slippery Rock University, in partnership with generous support from foundations and donors, such as the National Endowment for the Humanities, The Grable Foundation, and the PNC Foundation. Learn more about the Humanities Ladder program here. You can also download a brochure here. Students will experience living on a college campus while building skills to help them succeed through high school and college. When not in workshops, students enjoy activities like intramural sports, hip hop dance classes, game nights, off-campus field trips and more! Visit humanitiesladder.org to learn when the next camp will be offered. The Stone House Center for Public Humanities, in partnership with Slippery Rock Community Library and North Country Brewing Company, has donated a Little Free Library to share books, bring people together, and create communities of readers. Located on Main Street in front of North Country Brewery, the Little Free Library box will be available year-round. Community members and passersby are invited to give a book they’ve enjoyed, or take a book that sparks their interest. Each summer, a children's summer reading program is hosted at the Old Stone House. In the fall, we offer 'Spooky Stories.' Check out our News & Events section for upcoming offerings. 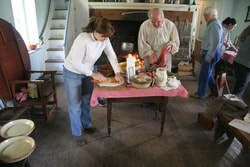 Tavern chefs Stan Malecki and Bill McGary lead interactive sessions in historic cookery, using real cast iron cookware and historic recipes, all prepared on the house’s open hearth or our authentic outdoor bake oven. In addition to food preparation, students learn how western Pennsylvania's food reflects its environment, culture and social customs. Click here for a complete schedule for the 2017 season, and to register for a class! We partner with a variety of faculty members and departments at SRU, as well as various community organizations. Click here to check out some of our latest events. "What we must learn to do is to create unbreakable bonds between the sciences and the humanities. We cannot procrastinate. The world of our future is in our making. Tomorrow is now."